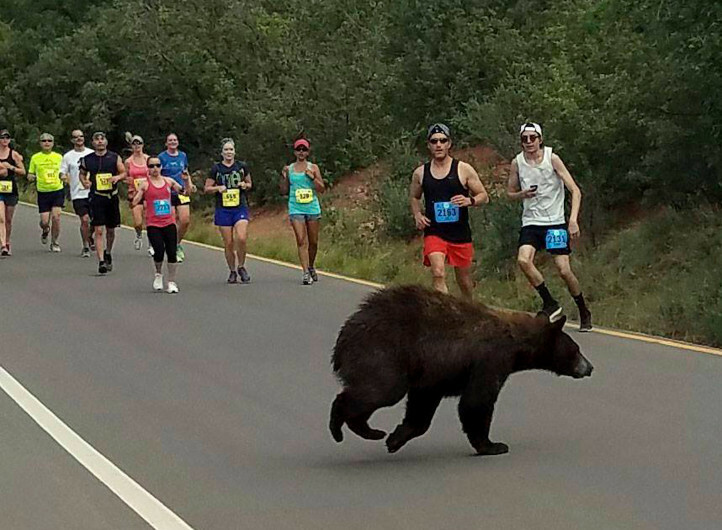 In this photo provided by Donald Sanborn, a bear walks across the street as runners compete in the Garden of the Gods 10 Mile Run near Colorado Springs, Colo., Sunday, June 11, 2017. Sanborn says the animal seemed to be trying to decide whether to zip across the road filled with runners when a large enough gap finally emerged for the bear to get through. COLORADO SPRINGS — Some runners didn’t expect to see a bear on their Colorado race route.